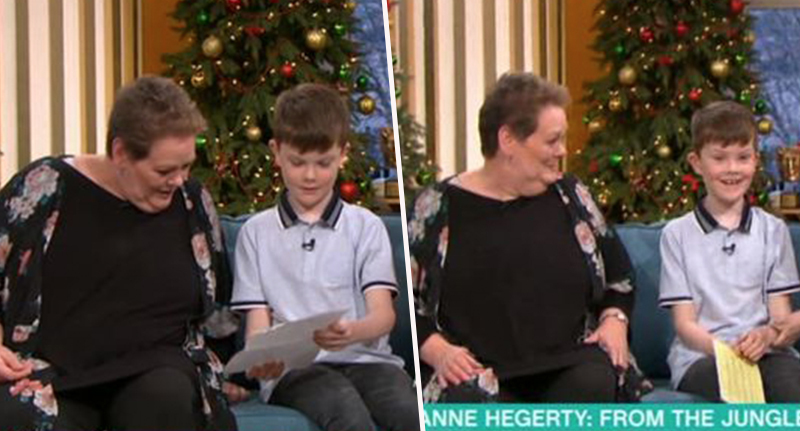 Viewers were in tears after watching Anne Hegerty meet a young boy with autism, who’s said to be her biggest fan. Anne met young Joseph Hughes on This Morning after he wrote her an emotional and heart-warming letter while she was in the jungle on I’m a Celebrity…Get Me Out Of Here! 11-year-old Joseph has been bullied due his autism, and his emotional letter prompted Anne to talk about her own Asperger’s. To Anne. My name is Joseph Hughes and I am 11. I live in Preston, Lancashire and I go to a specialist school. You are very clever. Sometimes people are mean to me because I am autistic but watching you makes me see that other people can have autism too and maybe I can have a cool job like you when I am older. Good luck in the Jungle I hope you win. Love from Joseph. Anne spoke to Phillip Schofield and Rochelle Humes about the letter before they surprised her by bringing Joseph and his mum out to meet her. Joseph said it was great to meet her and laughed as she shared her knowledge of Thunderbirds facts with him. I went really quickly from ‘I want to win this’ to ‘I hope I’m the first voted off’ to ‘get me out of here now’. It was recently revealed how Anne was on the brink of homelessness before capturing the nation’s hearts on The Chase. I just simply couldn’t keep it going and the result was I wasn’t paying my bills, but I was trying not to go on benefits on the grounds that I just thought that was sort of giving up. I wasn’t giving up. She was put on Disability Living Allowance to keep her afloat in the meantime. Anne then learned of a ‘high level quizzing circuit’ and joined the world of elite quizzers, made up of contestants from Eggheads and Mastermind, just in time to audition for the second season of The Chase. What an inspirational woman and young boy!